KUALA LUMPUR, Malaysia — Malaysia filed criminal charges against Goldman Sachs and two former executives on Monday for their role in the alleged multibillion-dollar ransacking of state investment fund 1MDB. Attorney General Tommy Thomas said the government is seeking several billion dollars in fines from Goldman Sachs for breaches of securities laws that involved it making false and misleading statements to investors. He said his office will seek prison sentences of up to 10 years for the former Goldman executives, Roger Ng Chong Hwa and Tim Leissner, who is married to model Kimora Lee Simmons. Malaysian and U.S. prosecutors allege that bond sales organized by Goldman Sachs for 1MDB provided one of the means for associates of former Malaysian Prime Minister Najib Razak to steal billions over several years from a fund that was ostensibly set up to accelerate Malaysia's economic development. The scandal, first reported by Sarawak Report and the Wall Street Journal, resulted in Najib and his ruling coalition losing power in a historic election defeat earlier this year. 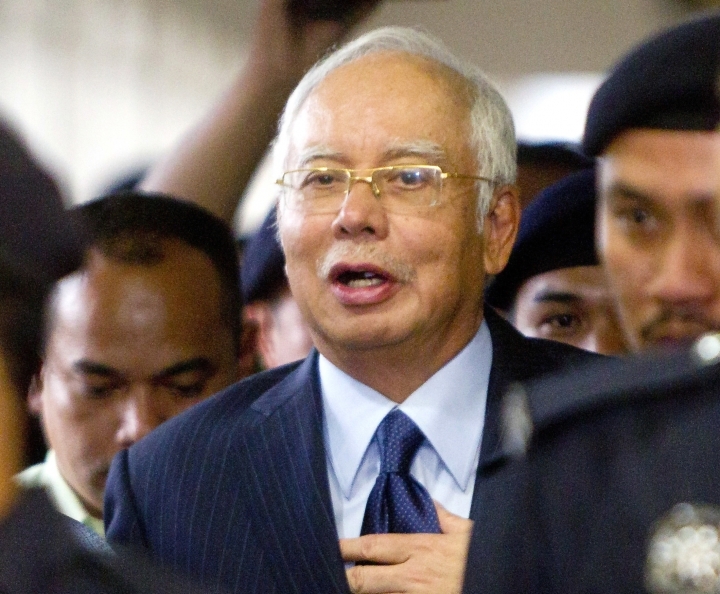 Najib himself is facing corruption charges. He has said that more than $700 million that moved through his bank account was a political donation from the Saudi royal family, but U.S. prosecutors say it came from 1MDB, of which Najib was the top official. U.S. legal filings that are part of a Justice Department civil case to recover assets bought with 1MDB funds allege the money was used to finance Hollywood films and spent on luxuries such as diamond jewelry for Najib's wife, a yacht, artworks and high-end properties. Goldman Sachs denied any wrongdoing in response to Malaysia's criminal charges. "We believe these charges are misdirected and we will vigorously defend them and look forward to the opportunity to present our case," bank spokesman Edward Naylor said in a statement. "The firm continues to cooperate with all authorities investigating these matters." Thomas, the Malaysian attorney general, said $2.7 billion was stolen from three bond sales organized by subsidiaries of Goldman Sachs. The investment bank, he said, received $600 million in fees for organizing the bond deals, which was several times higher than industry norms. Leissner and Ng conspired with Najib associate Low Taek Jho, a key architect of the entire 1MDB fraud, to bribe Malaysian government officials to use Goldman Sachs as the arranger of the bond deals, according to Thomas. They and Goldman Sachs knew that the money would be stolen, he said. "Having held themselves out as the pre-eminent global adviser/arranger for bonds, the highest standards are expected of Goldman Sachs," the attorney general's statement said. "They have fallen far short of any standard. In consequence, they have to be held accountable." Prosecutors plan to seek fines "well in excess" of the amount allegedly stolen because of the severity of the violations of Malaysia's laws, Thomas said. Leissner, who headed Goldman's operations in Southeast Asia, pleaded guilty in the U.S. last month to money laundering conspiracy and conspiring to violate foreign bribery laws after the Justice Department charged him, Ng and Low in relation to the 1MDB scandal. Ng was arrested in Malaysia in early November and Low, also known as Jho Low, remains at large. He has previously maintained his innocence in statements via a lawyer. "As has been stated previously, Mr. Low will not submit to any jurisdiction where guilt has been predetermined by politics and there is no independent legal process," a spokesperson for Low said in a statement on Monday. "It is clear that Mr. Low cannot get a fair trial in Malaysia, where the regime has proven numerous times that they have no interest in the rule of law." Malaysian police said in July that Low had fled Macau to an unknown destination. Before facing criminal charges, Low became well known in the New York City and Los Angeles club scenes. In 2012, he threw a lavish 31st birthday bash attended by Leonardo DiCaprio, Kim Kardashian and other celebrities.